ATC New Technologies spend most of their efforts on the life cycle management of high voltage battery packs along with concentrating on supporting OEMs. ATC also focuses on consumers with warranty and aftermarket issues of advantaged battery packs and strives to repair and rebuild lithium batteries for their clients. Lithium Batteries are known to be a cutting edge technology that is slowly replacing standard rechargeable batteries. Lithium battery chemistry is the newest technology among small and large corporations alike. These top of the line products offer a longer lifespan than conventional batteries as well as the luxury of a light-weight construction. If improper storage occurs, lithium battery storage can create hazardous situations that can pose a threat to nearby operations, personnel, and investments. ATC New Technologies (ATC NT) required an industrial chemical storage building to rebuild and repair used batteries. The quantity of lithium batteries and lithium battery parts being stored varied as well as the size of lithium batteries and lithium battery packs. In order for ATC New Technologies’ operations to run smoothly, lithium batteries and lithium battery parts storage needed to remain at a certain temperature. Lithium batteries can react and eventually spark and create flames, creating a hazardous situation when stored in a heated environment. Therefore, a cooling system is necessary to keep storage safe and compliant. Lithium battery storage by US Chemical Storage provides a compliant method for keeping your lithium battery storage safe. 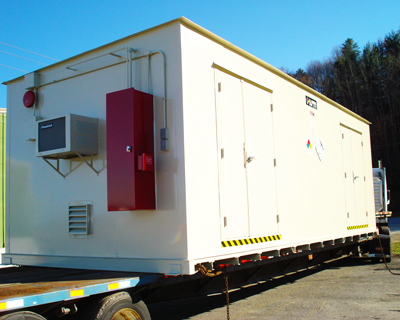 Our client requested a lithium battery storage building that had dimensions of 30’ long by 10’ wide, in order to meet storage capacity requirements. Our DRUMLoc building was designed for industrial use and constructed to exceed all EPA, OSHA, NFPA regulations, while meeting all FM Approval and Warnock Hersey standards. A cooling system was installed to keep the room at a specific temperature, below 80°F, to keep the lithium batteries stable. US Chemical Storage offers many accessory options to maintain and manage storage compliantly. Our client requested interior shelving, explosion proof electrical accessories, lighting, insulation and a panic exit door for increased safety. For maximum safety, a clean agent FM200 fire suppression device was implemented in case a fire hazard occurred inside the lithium storage building. Work tables were installed inside the building for the convenience of rebuilding and repairing batteries on-site. US Chemical Storage designed a state of the art lithium battery storage facility, while incorporating the strongest and most reliable lab equipment and compliant accessories that were custom-built for ATC’s operations. US Chemical Storage has been manufacturing top of the line chemical storage buildings for many different applications for over 30 years. All of our storage buildings are hand-welded by certified welders and inspected by professional engineers and factory tested before being shipped to your site. We are the leading manufacturer of fire rated and non-fire rated chemical storage buildings. Our buildings offer full compliance and exceed all EPA, NFPA, and OSHA regulations, while meeting all FM Approval or Warnock Hersey Standards. US Chemical Storage keeps your operations and personnel safe, while benefiting the environment’s health.